Despite Ceasefire, Humanitarian Crisis Continues in Gaza with 500,000 Displaced & 10,000 Injured | Democracy Now! The 72-hour ceasefire in Gaza has entered its final day. Talks are ongoing to extend the truce, but no agreement has been reached. Palestinian and Israeli officials are in Egypt, however have not held face-to-face negotiations on securing a lasting ceasefire. Meanwhile, Gaza is in a state of devastation and ruin. Close to 1,900 Palestinians were killed during the 29-day conflict, including at least 1,354 civilians, of whom 415 are children. More than 10,000 people have been injured. There are 373,000 children who require psychological support. Some 500,000 Palestinians have been displaced with 187,000 still living in U.N. emergency shelters. An estimated 10,000 homes have been completely destroyed, and 30,000 homes partially destroyed. On the Israeli side, 64 soldiers were killed in Gaza, and three civilians in Israel. We go to Jerusalem to speak with Christopher Gunness, a spokesman for the United Nations Relief and Works Agency for Palestine Refugees. JUAN GONZÁLEZ: The 72-hour ceasefire in Gaza has entered its final 24 hours. Talks are ongoing to extend the truce, but no agreement has been reached. Palestinian and Israeli officials are in Egypt but have not held face-to-face negotiations on securing a lasting ceasefire. Meanwhile, Gaza is in a state of devastation and ruin. Close to 1,900 Palestinians were killed during the 29-day offensive, including at least 1,354 civilians, of whom 415 are children. More than 10,000 people have been injured. AMY GOODMAN: There are 373,000 children who require psychological support. Half a million Palestinians have been displaced, with at least 187,000 still living in U.N. emergency shelters. Ten thousand homes have been completely destroyed, 30,000 homes partially wrecked. Meanwhile, 64 Israeli soldiers were killed in Gaza, three civilians in Israel. We go now to Jerusalem, where we’re joined by Christopher Gunness, spokesperson for the United Nations Relief and Works Agency for Palestine Refugees. Can you talk about the devastation on the ground right now in Gaza, Chris? CHRISTOPHER GUNNESS: Look, it’s devastation which is both physical and emotional. What we’re seeing physically, you’ve seen on your TV sets. And unfortunately, we need to get scores of site engineers out into the field before I can make an empirical determination and tell you exactly how many homes have been destroyed, but there’s plenty of anecdotal evidence. And the fact that people are leaving our shelters, going out and then coming back suggests that they’re going back to destroyed homes. And don’t forget, these were homes they were told to leave, in leaflets that were dropped by the Israeli army. Well, it now would appear, at least from this anecdotal evidence, that a lot of those homes—and we estimate the homes of about 10,000 people—have been destroyed or damaged. So, we’re now in a situation where this catastrophic human displacement crisis is morphing into something equally disturbing for us, which is a huge homelessness crisis. As far as the psychological scars are concerned, imagine being a child in Gaza. If you are just five years old, three times in your short and fragile life you will have been subjected to this extraordinarily terrifying and traumatizing bombardment that we’ve seen in Gaza. We estimate that there are about 400,000 children deep in trauma. So, yes, it’s important to look at the physical nature of the destruction, but also—and I fear it’s going to last a lot longer—the psychological nature of the destruction. JUAN GONZÁLEZ: And what about the basic services of those who leave the U.N. shelters and go back to whatever is left of their homes—electricity, water? What’s the situation there in Gaza right now? CHRISTOPHER GUNNESS: Well, people may have seen, about 10 days to two weeks ago, pictures on their screens of the only power plant in Gaza that was hit, with thick, black smoke billowing out of it. Now, already, there was about, on average, per household per day, four hours of electricity. Now, imagine a home in America—or anywhere else in the world, for that matter—with four hours of electricity a day, and imagine if the main power generator gets hit, and that is reduced, that time is reduced. That’s what’s happening. That’s as far as electricity is concerned. There is ample evidence that the water system has been hit. You may remember back in the early days of the conflict there were three or four workers from the public water works who got killed in the field, and they then refused to go out. And who can blame them, frankly? And so, there were no repairs done. So, for the last month, where the water system has been hit, it just hasn’t been patched up. So, already a water system where 95 percent of the water in Gaza is undrinkable—I mean, I’ve been there many times; you turn on a tap, and salt water comes out. So, 95 percent of water undrinkable. Sewage—millions of liters of sewage flow into the sea every day. And by the way, it flows north towards Israel, another example of why good neighborliness would be a good idea. But, you know, water and electricity, public utilities, are decimated. And we don’t even know yet, until we’ve been out and surveyed, quite what the extent of the damage has been. AMY GOODMAN: —within Gaza? Can you explain? CHRISTOPHER GUNNESS: Well, I mean, people were told to leave their homes, so they walked through—they abandoned their homes with great rapidity, terrified. I mean, imagine being an old person or a disabled person. I can tell you what the streets of Gaza are like at the best of times. Anyway, they were told to abandon their homes. They did. They came to U.N. shelters. Some, though, went to stay with family and friends. Some of those staying with family and friends, and certainly in U.N. shelters, were then directly hit by the Israeli army. I’m not saying it’s deliberate, but I’m saying we need investigation to find out. They’re now going back and finding that the very army that told them to leave their homes has now apparently, in the case of at least 10,000, possibly more, people, had their homes destroyed by that army. Now we begin to have to ask ourselves questions about the responsibilities for this, because the automatic assumption is that UNRWA and the U.N. will pick up the pieces, though you did hear the secretary-general say very firmly last night, “We will not rebuild Gaza again.” So, you know, if we are going to rebuild Gaza, first of all, let’s have the blockade lifted, because it’s going to be pretty much impossible to rebuild Gaza with the sort of restrictions that are there now. And by the way, the prospects of peace also recede quite significantly if the blockade persists. So, you know, there’s a huge, huge task ahead, and that is why we say we’ve moved beyond the realm of humanitarian action alone. OK, UNRWA can carry on handing out bits of food and tins of vegetables and all that stuff, but we can’t carry on doing it indefinitely. The people of Gaza used to have a really solid trade relationship with the people of Israel. I mean, interestingly, when the blockade was first implemented, the complaints that we got most were from the Chamber of Commerce in Tel Aviv, because it was Israeli businessmen and Israeli businesses that were being so badly hit. And there’s no doubt in my mind that political movement follows where economic activity leads. And if we can show these two peoples that lifting the blockade for exports and imports can be done peacefully—of course, Israel has perfectly legitimate security concerns. If you look at some of the incidents, military, militant incidents that have happened that these crossings, I wouldn’t want my children working in these crossings. They’re dangerous places. So there are legitimate security concerns. At the same time, there are also economic and political rights that the people of Gaza have, and they have to be respected in the context of an agreement which sees the blockade lifted while respecting and dealing with Israel’s legitimate security concerns. JUAN GONZÁLEZ: Christopher, Christopher Gunness, I wanted to ask you also—there’s been at least some 10,000 or more people injured. During the ceasefire period, has Israel been permitting some of these, especially the most injured, to be able to be moved out of the country to other medical facilities? CHRISTOPHER GUNNESS: I mean, not in large numbers. The details of that, you’d really have to get—the precise details, you’d have to get from the World Health Organization. But, of course, again, let me refer to those elements of international humanitarian law that make clear the obligations of an occupying power. I mean, the background to all this is it is the occupying power which has the obligation to protect civilians. These are civilians who just had their homes destroyed and whose children are now deeply traumatized and who are burying their dead. And in some cases, their dead are still left underneath the rubble. I mean, one friend of mine went into one of these destroyed areas of Gaza just yesterday and said there’s just an unbearable stench of decay everywhere. That’s the reality. And so, you know, we say, we have to restore the dignity to the people of Gaza, because for a month their humanity and their dignity has been denied. And there are several ways of restoring their dignity. One, of course, is to have a proper investigation, because you can’t grieve and move on if you don’t know what happened to your loved one. You know, even in death, human dignity must be respected. And part of the respect for human dignity in death is allowing the loved ones to know what happened. So we have to have an investigation, not just as a jurisprudential exercise, an exercise in justice, which is clearly extremely important, but as an exercise in psychotherapy. And beyond that, of course, we need to look at the lasting causes of the conflict, because all of my Israeli friends, and certainly all the people I know in Gaza, are adamant that they can’t go through this again. It’s done Israel no good on the international stage, which is something I hope which matters to Israelis. But more important, as far as the people of Gaza are concerned, it’s led to intolerable suffering. So the idea, after all of these people killed, after all the injury, after all the dead babies and civilian death, all of that, we return to the status quo ante, that must be unthinkable. And, you know, shame on any of the peacemakers who are seriously considering that as an option. CHRISTOPHER GUNNESS: You can only consider that as an option if you want to return—sorry, please. AMY GOODMAN: If you want to return to? CHRISTOPHER GUNNESS: To the status quo, in a situation where millions of people, every two years, are terrorized. It’s utterly unsustainable. Sorry, I’m losing my voice. 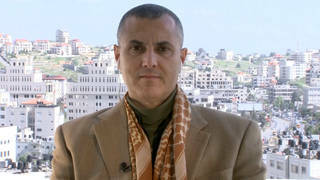 AMY GOODMAN: Christopher Gunness, we want to thank you very much for being with us, spokesperson for the United Nations Relief and Works Agency for Palestine Refugees. It’s called UNRWA. This is Democracy Now! When we come back, Professor Noam Chomsky joins us from Boston. Stay with us.